First, I want to thank everyone who signed up to participate and completed the April post. I noticed that a lot of the bloggers used SeedGROW or some variant of the project title in the post, which is well and good. Although, feel free to change it up a bit to your benefit. For example; if your next post is about how to fertilize your Nasturtium seedlings you could title your post "How-to Fertilize Nasturtiums," "Fertilizing Nasturtium Seedlings," "Fertilizing Nasturtiums." Using keywords from your post will help your blog post get placed in search engines and help people who are using Google to find gardening advice discover your blog. Also, make use of the alt attribute when you upload images to your blog so that when people use Google image search they may find your post. The May posts are due May 2, 2010. Feel free to leave the link to your May post in the comments here, tweet them to me on Twitter ( hashtag #seedGROW ) or place them in the Facebook group. Our Little Acre~ Nasturtiums are Go! Yard is Green~Seed Grow Project-'Spitfire' Nasturtiums! I covered different combinations of plants that will look good with 'Spitfire.' Better late than never, I hope? My post is up, rain delay. 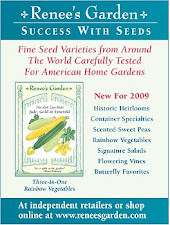 Support Renee's Garden. Heirloom veggies, herbs and unusual flowers.